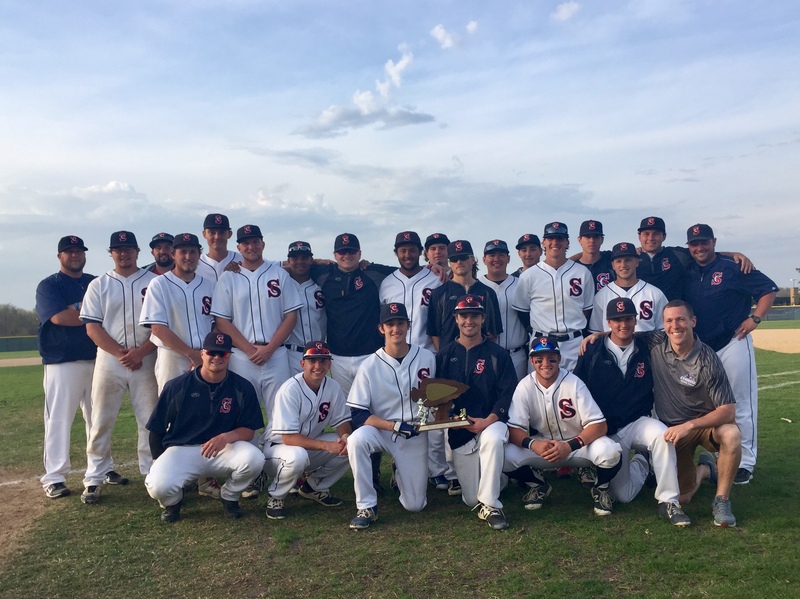 For the first time in 10 years, Carl Sandburg College is home to the Arrowhead Conference baseball champion. The Chargers earned a share of their first conference title since 2008 and sixth in program history with a split of a doubleheader against Black Hawk on Tuesday afternoon at the William “Bill” Hungate Baseball/Softball Complex. Sandburg won Game 1 10-4 and nearly claimed the outright title in Game 2, but the Braves withstood a game-tying three-run Chargers rally in the seventh to win 8-6 in eight innings, leaving the teams as co-champions with identical 16-4 league records. Sandburg took the lead for good on a third-inning sacrifice fly from Kevin Ulrich (Roanoke, Ill./Roanoke-Benson) that made it 2-1. Antonio Dominguez (Rock Island, Ill./United Township) extended the Chargers’ lead to 4-1 in the fourth with a two-run homer to center field. Up 6-2 in the sixth, center field Payton Hartbank (Mattoon, Ill./Mattoon) blew the game open with a no-doubt, three-run homer to right. Making his first start since March 30 because of a leg injury, sophomore Mitch Smith (Moline, Ill./Sherrard), a transfer from Black Hawk, kept the Braves’ bats quiet for much of the contest. After surrendering a leadoff double that led to the game’s first run, Smith retired 15 of the next 16 batters he faced. The righthander went the distance, allowing six hits and a walk while striking out seven. Sandburg forced extra innings with three two-out runs in the seventh. Ulrich’s base hit to right made it 6-4, and, with the Chargers down to their final strike, Dominguez followed with an RBI single up the middle that saw Ulrich score the tying run from first when the Black Hawk center fielder misplayed the ball. Black Hawk went back ahead in the eighth when Ryan Lorber, whose fourth-inning grand slam gave the Braves a 5-3 lead, hit a solo homer to left. BHC added an insurance run in the inning on Nick Acri’s single to right. The Chargers didn’t go down without a fight in the bottom of the eighth, as Hartbank and O’Brien were hit by pitches to load the bases with two out, but Shane Coleman (Abingdon, Ill./Abingon-Avon) popped out to short for the final out. Shortstop Braedon Blackford (Peoria, Ill./Notre Dame) reached base three times, including hitting a leadoff homer to center to give the Chargers an early lead. He finished 2 for 4 with a walk, run scored and two RBIs. The Chargers (25-11 overall) step out of conference play for their final four opponents of the regular season, starting with a nine-inning game at 3 p.m. Wednesday at home against Spoon River.